This question is given 2 marks, which means that you do not need to do much to complete this, and anything more than a few lines and 2 minutes spent means that you are wasting your time. You effectively have to show that you have selected the right approach and that you have produce the right answer. However, just writing the answer alone will not give you the 2 marks you need. For the expression to be greater than zero, then both of these parts must be positive or both must be negative (since multiplying two negatives will create a positive – you knew that, didn’t you!). For both of these parts to be positive, then must be greater than 4 (NOTE: not greater than or equal to – it must be GREATER than only otherwise it will become zero). For both to be negative, then must be less than zero. This has 2 marks, and 2 marks is 2 minutes of work maximum. However, you can solve this far quicker since you have already been given everything you need to know in the question. You will recognise this as a factored quadratic expression,, and thus you do not need to do the factoring first. For any expression of the form to equal zero( ) it is required that either one of or is equal to zero. It is not possible for this expression to be zero is both are non-zero, and thus one MUST be zero, and this means that EITHER or BOTH can be zero for the expression to be zero. From we can determine that . NOTE: This is and not (which would be considered a silly mistake). When writing this answer consider that the examiner is expecting to see, which parts of your answer have value which would warrant the allocation of a mark. 1 MARK: Giving the information that EITHER of the parts must be zero. 1 MARK: Giving the correct answer. How you write this answer is important, to emphasise to the examiner where your most important parts of your answer are, even if you have done other calculations. The Grade 12 supplementary examination for mathematics was made available on 26 July 2017 for download. This page looks at Question 1 of Paper 1 which, like all examination papers for many years, is on algebra and the solution of equations and inequalities. Notice first that this Question 1 carries a total of 22 marks. The total for each paper is 150 marks, so that this question contributes 22/300 = 7.2% of the total marks. I will be emphasising this point, since it is possible for you to score full marks on this question and then this is already 7.3% of what you need to pass, and to excel. Another point to notice is that the total marks of 22 for this question also indicates that you should be spending no more than 22 minutes on this question – based on the rate of one minute for one mark. This is not completely correct mathematically, since in three hours there are actually 180 minutes (you knew that, didn’t you! ), but aiming for one minute per mark then should provide you with a 30 minute buffer for those questions you are struggling with. Ideally you should be spending less time then the one minute per mark on the “easy” questions, to gain further time for the other questions which are more challenging. You will have a little time to read and during this time you should recognise the problem forms and to plan your approach. Sub-question 1.1 consists of three questions in which you need to solve for , with the first being a factored trinomial, the second being an exponent, and the third being an inequality. 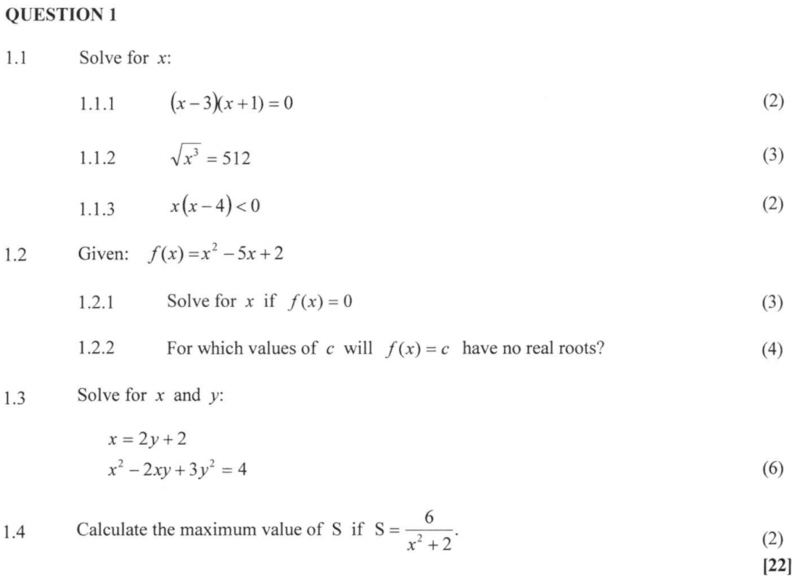 Sub-question 1.2 uses function notation and asks you to solve the equation and then the second part, worth 4 marks is to determine the nature of the roots. Sub-question 1.3 is simultaneous equations, with one being linear and the other quadratic, in two variables x and y. Finally, sub-question 1.4 asks for the maximum value of a potentially complex expression, but it carries only 2 marks, so there must be some simple solution.